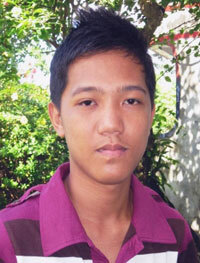 Jayson is a young man sponsored as a child in CFCA’s Hope for a Family program in the Philippines. He reflects on his first day of college with gratitude for what sponsorship has done for his education and life. I became part of the CFCA sponsorship program in 2003. Now I am a first-year college student taking a bachelor’s degree in education. I can still remember my first day as a college student. As I left our house and walked along the street, I saw a little boy crying. I asked him why he was crying. I realized that I am lucky to be part of the CFCA family receiving a complete set of school supplies before the school year. I reached the jeepney stop and rode a jeep. Inside the vehicle, I saw a young woman taking pictures of the Mayon Volcano and LigÒon Hill, two tourist spots in Legazpi. I thought, I am thankful because I have already seen those beautiful views when we had our field trip hosted by CFCA. When I arrived at school, I noticed that it might rain but had nothing to worry about. I have my umbrella, given by the sponsorship program. While I was walking, I saw a boy sitting under a tree. He looked sick. Again, I told myself how lucky I am because CFCA allowed us to undergo medical and dental checkups annually. CFCA also provided vitamins and prescribed medicines for us to become healthy. I found our classroom. Our professor collected our class cards and asked about our summer vacation experiences. One classmate said he did not really enjoy his summer vacation, for he had to work and earn money for his studies. Again, I felt how blessed I am to be part of CFCA summer outings and sports activities. They let us spend our summer vacation in meaningful, joyful experiences. After class, I went to the school canteen. There I saw my former high school classmate working. We talked, and she told me her family does not have enough money to pay for her tuition fees and her other school needs. When I heard that, I told myself I am lucky. CFCA plays a major role in my studies as I am a sponsored member and a service scholar. It lessened my parents’ financial obligation to my college education. I am grateful because I already attended seminars like that, facilitated by the CFCA program. Finally, I was in front of our house. Before I entered, I remembered what had happened that day. I appreciated more how blessed I am to be part of the CFCA family. Through CFCA, I have the opportunity to continue my studies, reach my dreams and look forward to becoming a licensed teacher. Isnít it…I am so lucky! We have been sponsoring a young girl (now young lady) since 2004, and it is as rewarding as raising our own children. We have always donated to charities and childrens’ causes, but the awesome opprtunity to help someone live, get educated, and grow up to follow a dream is sheer joy!! The great pleasure for us is corresonding with her. The whole family loves to write, make her pictures, add anecdotes about their experiences, and we love her responses as she shares her life and thoughts with us. She especially loves to correspond with our oldest daughter, as they are nearly the same age, and are making choices about college, career. We see her genuine enthusiasm and loving nature, and are so grateful to have her in our lives. Wow!! That was too long, but this is what happens when I get started telling people about CFCA. Thank you so much, Teresa!! This was such a neat story and testimony about your sponsored friend. I loved reading about how your whole family is involved in the sponsorship, too. We’re blessed to have you in the CFCA community! I am now an engineer because of CFCA… Thanks you CFCA for giving me an opportunity to be a part of your family…. How wonderful it is to know how much CFCA helps. This post helps me understand the benefits young people get from CFCA. And this young man’s gratitude shines through.